As you color your way through the pages of this beautiful and interactive coloring book, you will find rest and peace to quiet your mind and heart. Peaceful garden images filled with blooming flowers, butterflies, and birds are a blank canvas to be colored. The illustrations are accompanied by words from the timeless, inspirational hymn "All Creatures of Our God and King." 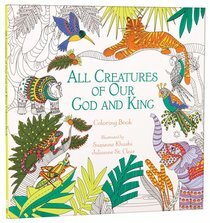 About "All Creatures of Our God and King (Adult Coloring Books Series)"